New York's Museum of Modern Art, located in the heart of midtown Manhattan, is a striking, modern structure, home to over 150,000 modern artworks and thousands of film archives. Founded in 1929, the MOMA, as it is known locally, was the inspiration of three prominent society matrons, Abby Aldrich Rockefeller, Mary Sullivan, and Lillie P. Bliss. Begun with just eight prints and one drawing, the museum has grown to international prominence and is home to some of the world's most recognizable paintings and sculpture. 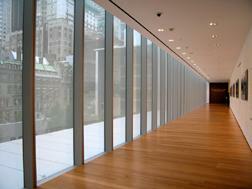 New York's Museum of Modern Art is dedicated to 20th and 21st century art. Among the over 150,000 works in its collection are such masterpieces as Van Gogh's Starry Night, Salvador Dali's The Persistence of Memory, and Paul Cezanne's The Bather. The MOMA's collection also includes multiple works by modern American masters, including Andy Warhol, Jackson Pollack, Jasper Johns, and Edward Hopper. The MOMA was one of the first museums to consider photography as an art form and the museum has an extensive collection of early 20th century photography, including works by Edward Steichen and John Szarkowski. The MOMA also prides itself on its extensive film archives, which includes over 25,000 reels and millions of film stills. The film collection ranges from early silent films to modern, independent works. Finally, the MOMA has a varied design wing, which features decorative arts by such designers as Eames, Noguchi, and Paul Laszlo as well as industrial "art" including an entire Bell 47D1 helicopter. The Museum of Modern Art reopened in November of 2004 in a beautiful, new, 640,000-square foot building, designed by Japanese architect, Yoshio Tanuguchi. The new building has approximately doubled the exhibit space of the former building. Highlights of the new building include a soaring 110-foot atrium and the peaceful Abbey Aldrich Rockefeller sculpture garden. The museum's facilities also include two film theaters, located directly below the lobby area, an extensive research library and a 150-seat auditorium. The Museum of Modern Art is located in the heart of midtown Manhattan at 11 W. 53rd Street, between 5th and 6th Avenues. The museum is open six days a week (closed Tuesdays) and is closed for Christmas and Thanksgiving Day. Hours vary, but the museum is open late at least one night each week. Facilities at the MOMA include an extensive gift shop with art prints, jewelry, cards, and other unique items for sale. The museum complex also includes three restaurants, including a cafeteria-style espresso and sandwich bar, a sit-down full-service eatery, and a fine-dining restaurant. Admission to the Museum of Modern Art is $20 for adults, $16 for seniors, and $12 for students. Children under 16 are admitted free as are museum members.